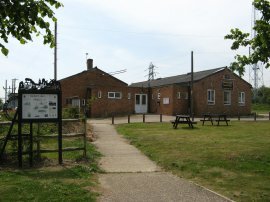 I did this walk on Monday 25th May, driving down to Sandwich where I parked close to Sandwich station. 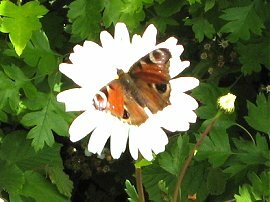 This was just a short distance away from the Ropewalk where I resumed my walk along the route of the White Cliffs Country Trail. 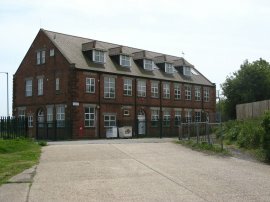 The Ropewalk, photo 1, forms part of the old town walls of Sandwich and has a moat running alongside it. 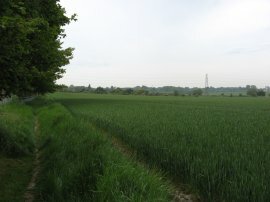 The Ropewalk is followed to the Woodnesborough Road, photo 2, where the trail then heads to left, following the road round to cross over the railway lines. Just before the junction with St Bart's Road the route joins a footpath on the left that heads down a track and then turns to the left to run alongside the back gardens of the houses that line the Woodnesborough Road. 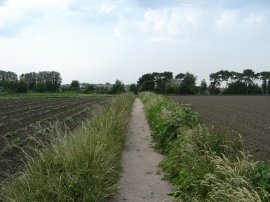 This stretch of path, which has fields to the right, photo 3, is followed down to reach the A256 road. 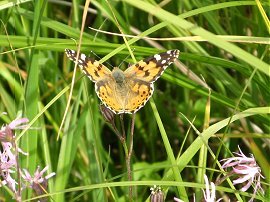 On the way I passed by a very friendly tabby cat and also saw quite a large number of Painted Lady butterflies at the field edge. At the end of the path the route turns to the left to briefly rejoin the Woodnesborough Road as it crosses over the A256. Once over the road the route turns to the left joining a track that runs parallel with the main road, photo 4. At the junction I spotted one of the old White Cliff Country Trail way markers although the sign was almost completely obscured. Reaching a roundabout the route crosses back over the A256 and heads a very short distance to the left alongside the A258 to join a footpath on the right that leads out into an orchard, photo 5 which contained a variety of different fruit trees including a number of cherry trees which were enclosed in swathes of green netting to keep the birds off. 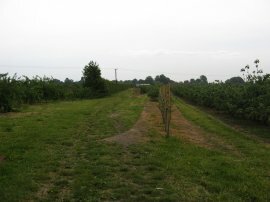 The route heads across Felderland Lane and continues alongside a large field of blackcurrants, photo 6, before turning to the right and heading past more orchards on the right and a small patch of woodland to the left. Leaving the orchards the path heads alongside a field edge running just above the small North Stream, which lies hidden in the grassland to the left of photo 7. 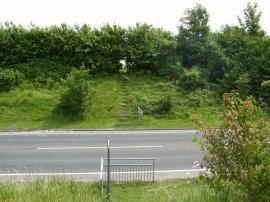 The marked route of the footpath along the field edge was quite overgrown as there is now a permissive path that runs alongside the course of the North Stream as the route makes its way down to cross back over the A256 again. Once over the road the route heads between fields before turning to the left to join a tree lined track that heads up into the village of Eastry. 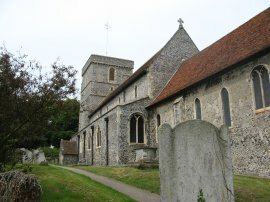 Here the route turns briefly left down Church Street to enter the churchyard of St Mary's Church, photo 8. Leaving the end of the churchyard the route takes a footpath that bears to the right across a small field. At the corner of the field the route crosses a stile where there was probably the best preserved White Cliffs Country Trail way marker I encountered on all three stages of the walk, photo 9. 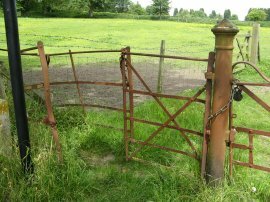 The route then heads down a short stretch of path to pass through the rusty iron gate in photo 10 to join Brook Street. Turning to the left, the road is followed round a left hand bend before the White Cliffs Country Trail joins a footpath on the right that heads uphill through a narrow band of trees to enter a field that was planted with barley when I went by. 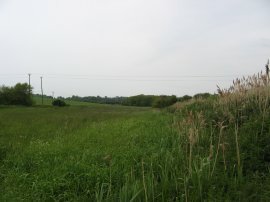 The path heads alongside the field edge to once again reach the A256, photo 11, which the route heads straight across. 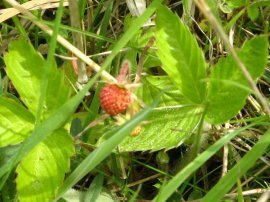 Heading up the steps on the far side of the road I noticed a wild strawberry, photo 12, that was almost ripe. 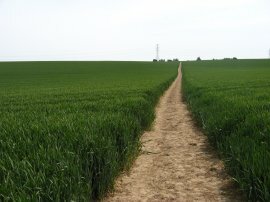 Once over the road the route heads over a field and, reaching the far boundary, turns to the left to join a footpath that runs between paddocks to join the road at Hay Hill. 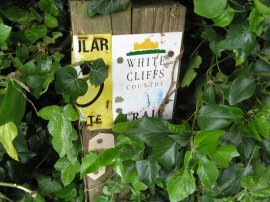 On my OS map there is a short section of the White Cliffs Country Trail marked as running to the left along Hay Hill, down to the A256 where a section of path then runs alongside the fields besides the main road up to the point where I had crossed over the A256 on my approach to Eastry. I assume the point of this link is for people who want to avoid the double crossing of the A256, in and out of Eastry. At Hay Hill I turned to the right, continuing along the road until the end where the White Cliffs Country Trail continues straight ahead, crossing over a large open field, photo 13. 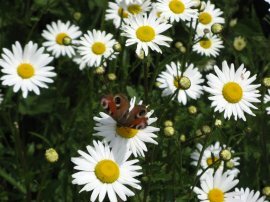 Crossing another minor road the path runs along a field edge for a short distance where I spotted the Peacock Butterfly in photo 14 resting on a clump of daisies, photo 15. 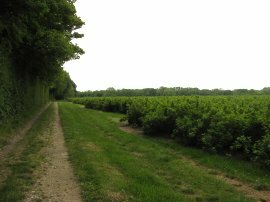 Where the hedge finishes the footpath splits into two and I took the right hand fork that headed across another large open field, photo 16. This leads to Marley Lane where the route turns right and then left to join another footpath that runs over a field to reach Broad Lane on the outskirts of Betteshanger. Here the route once again crosses a road and heads besides some playing fields to join a concrete track. The main course of the route heads to my left but I turned to my right and continued up the track passing the old mine building in photo 17 to reach the Betteshanger Social Club, photo 18 which I had walked to in stage 1 of this walk. This was the location of the now demolished pit offices. 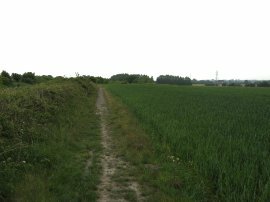 Having now completed that loop of the walk I turned and headed back down the way I had come, following the concrete track down to a short stretch of footpath that leads back to Broad Lane. Crossing over the road the White Cliffs Country Trail joins another footpath that heads diagonally over a field to the village of Finglesham, photo 19. 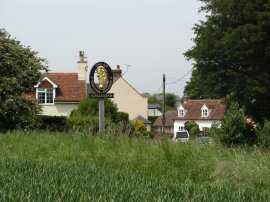 I headed to the left along the road, passing the rather tempting village pub, before taking a footpath on the right that runs between houses to reach a marshy area of ground where once again the route of the trail was very overgrown, photo 21, although on this occasion with no alternative path. 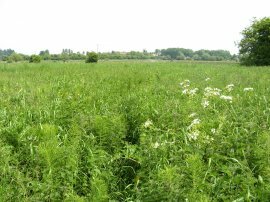 There were a fair number of nettles growing along the path and my legs got a few stings as I went by, even though as always I was wearing my long trousers. 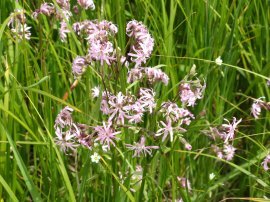 There were also a good variety of flowers growing, including the Ragged Robin in photo 22 which was proving attractive to the Painted Lady Butterflies, photo 23. (Click the green text to see a larger version of the photo). 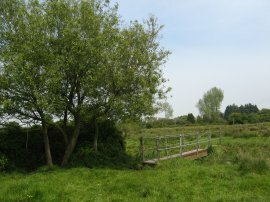 After heading over a couple of footbridges, photo 24, the path joins a more enclosed section of path that runs down to a pub car park and the A258 road. 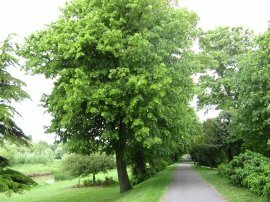 Here the White Cliffs Country Trail turns to the left heading down the road for a few hundred yards before joining the first road on the right at Hacklinge. The A258 was quite busy with bank holiday traffic however there was a footpath running alongside the road. The route passed a boarded up petrol station and also crossed over a small stream where, looking down from the bridge, I spotted one of the largest freshwater fish I have ever seen. It really was huge and I was quite surprised to see such a sight while walking along a main road. I tried to take a couple of photo's although the fish was quite obscured in the water and there was also no reference point to give any indication of scale. 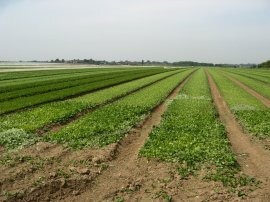 Once off the main road the route soon joins a track running besides a large field planted with what I think was spinach, photo 25. Just past the end of the large field the route turns to the right heading along a field edge to join another rather overgrown stretch of path running alongside a drainage one of the many drainage ditches that criss-cross the area. 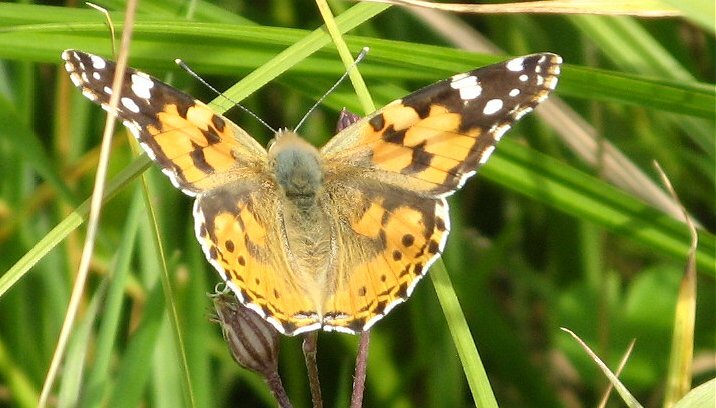 This led up to a small Hacklinge pumping station by the twin channels of Roaring Gutter Dyke, photo's 26 and 27. 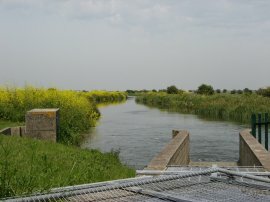 This pumping station pumps water from the North and South Streams into the Roaring Gutter Dyke and the Delf Stream allowing it to drain into the Lower Stour near Sandwich. 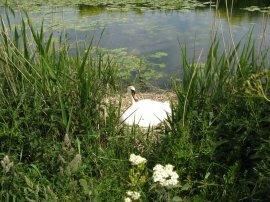 The covers over the outflow channels made an ideal place to stop for lunch although the peace was somewhat disturbed as the slightly noisy pumps sprung into action just after I sat down. 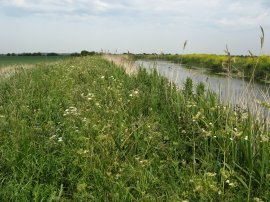 From the pumping station the route heads along the left hand bank of the left hand channel although as can be seen in photo 27 the path was completely overgrown and once again there were many nettles waiting to sting me as I went through. Whilst not the marked path as per the OS map, there is a track that runs alongside the right of the other channel which could be used to avoid this section. 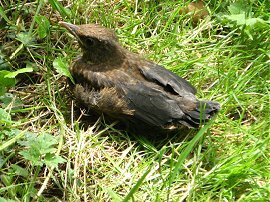 It was slow going along the overgrown path however there was plenty of wildlife to see, photo 28, and I also spent ages trying to get a photo of a reed warble of which I saw several, however without success. 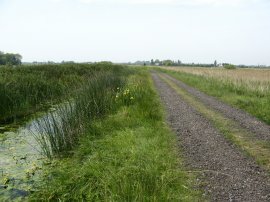 Eventually the bank side path joins the main track, photo 29, which is followed over the marshes to reach Goretop Lane. Here the route heads left up the road before turning to the right along another lane. 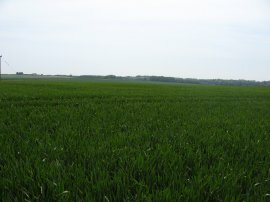 This is followed round to the right before the White Cliffs Country Trail joins a paved footpath on the right, photo 30, that heads between fields to join the Deal Road on the outskirts of Sandwich. From here it was just a short walk along the road back to my parking place. On the way I had a quick look round the grounds of St Bart's Chapel, photo 31. 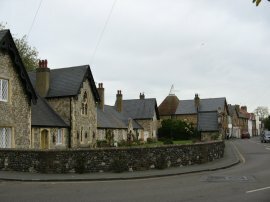 St. Bart's was founded in 1190, for the "accommodation of pilgrims and travellers where they might be furnished with lodgings, provisions and other necessaries for their journey" on the site which it still occupies in Dover Road on the outskirts of the town, but it fairly soon became a Hospital providing a permanent home to sixteen brothers or sisters. 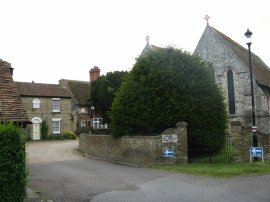 To begin with, the brethren lived in common, though they had separate rooms; now they have individual houses which stand around the chapel, each with the name of the resident on a plaque on the house wall. The Hospital chapel, built in 1217 as part of the original foundation, is still used for its original purpose today. Sandwich itself is an interesting town which is well worth exploring. Reaching the car I had walked a total of 11.1 miles and also completed the entire White Cliffs Country Trail as marked on the OS Explorer Maps 150 and 138.